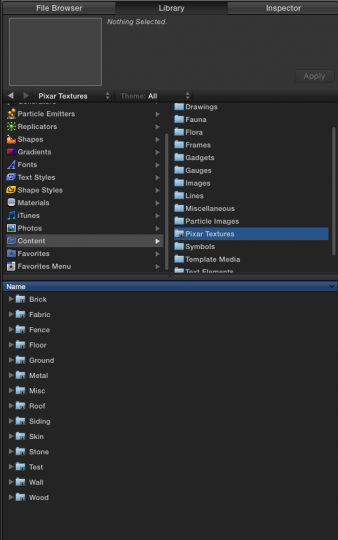 PixarTextures-toMotionContent ⬅︎ Download this Zip file and unzip it in the Finder. Type command-N to open a new Finder window. Type command-shift-H to open your Home (user) folder. Navigate to Application Support > Motion > Library > Content. Restart Motion. 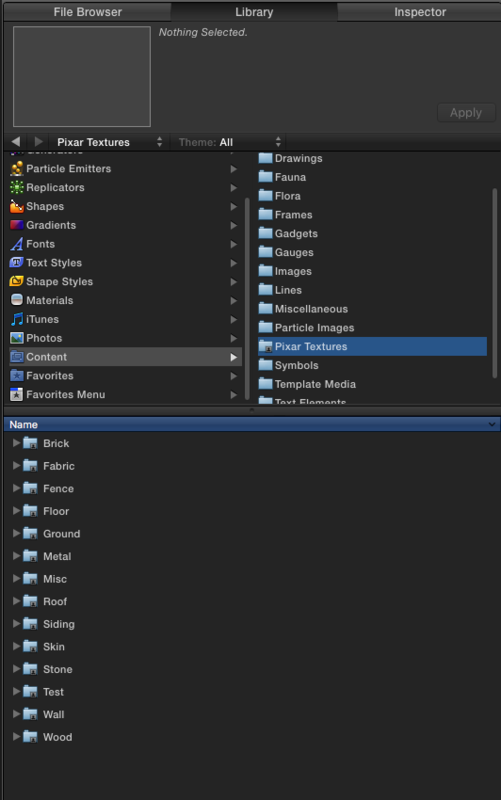 Navigate to the Library tab > Content and you should find the Pixar Textures folder in the right column. Selecting the folder will open the collection, ordered by folder, in the content pane at the bottom. In the Test folder, you will find the NTSC color bars test pattern, and two Macbeth Color Checkers. These are some of the finest textures you will find anywhere for use with Motion 3D Text. Each texture pattern comes with an image and a “bmp” (bump map) version as well as a “normal” version (new and improved bump map). They are licensed under Creative Commons, available for personal or commercial use (attribution to “Pixar Animation Studios” required.) I am even allowed to transform and repackage these textures in this manner for use in Apple Motion.